The good news for nonprofits feeling a bit perplexed about publicity-seeking is that the media is indeed always hungry for content. So whether your nonprofit is local, regional, or national in its scope, the key is to reverse-engineer what they’re seeking and provide compelling information to them in a timely manner. Events and anniversaries present prime opportunities as the two key questions an editor or producer typically asks when being presented with a pitch is “why you?” and “why now?” So if you have a milestone coming up, planning your media outreach to fully leverage the opportunity is key as you may not have a similar opportunity for some time thereafter. For those needing to manufacture a newsworthy “event,” you might try camping onto one of the even zany holidays which can be unearthed by researching sites like www.HolidayInsights.com or www.NationalDayCalendar.com. In getting underway with your media outreach, if you have the latitude, try to do some diligent advance work in terms of sussing out any competing events being held at approximately the same time – if needed, you might consider rescheduling to achieve a clearer window of exposure. A nonprofit whose 25th anniversary I oversaw publicity for last year chose Memorial Day weekend for their mega event which was helpful for those attending (namely 500 volunteers who traveled from near and far to construct 25 homes for poor families over the course of two days), but nevertheless timing which ultimately proved a challenge in courting the media — especially given this particular event was also held across the border in Mexico and had no relevant tie-in with our American holiday of honoring our veterans. In this example, you can well imagine how many events were happening nationwide over that same high profile 3-day weekend. Once you’ve done your best to ensure you’ve created the optimal timing for raising your organization’s profile, the next critical aspect is correctly targeting the media as well as utilizing appropriate lead times. If you’re seeking coverage in a monthly publication, you need to contact them a solid three months advance. For daily newspapers and radio, three to four weeks is typically sufficient. It might SEEM that contacting a given media outlet sooner yet would somehow give you an advantage, but you would be wrong in most instances. So, while a bit on the nerve-wracking side to pitch closer to an event, that’s nevertheless a matter of respecting the media’s own internal timetables. Do your homework to ensure you’re reaching out to the most appropriate media in terms of the audience they serve and ensuring your message is of appeal to them. You may want a given media, but it’s instead all about why they should want you(r story). I also cringed when a well-meaning client suggested offering pay to a journalist – that’s completely unethical and would be a total nonstarter. That whiff of desperation also won’t endear you to a media professional. Particularly important is thinking about which medium will be best to tell your story. Is it something that needs to be explained or discussed? Perhaps radio interviews would be ideal if so. If you want TV coverage, is the story “visual?” — showing will be the determining factor here, and having video footage to incorporate is typically essential for television. Also be aware that competition for coverage in physical print publications is stiffer than ever due to their lamentably waning ranks. So you can also research relevant high traffic websites and/or bloggers for exposure (use the same lead time referenced above for daily newspapers). Some first tier media publications also have separate online divisions and it is somewhat “easier” to get coverage with them as they are unrestricted by the economics of ink, paper, and postal costs. What is most helpful as you commence pitching is, again, to focus on what’s in their best interest. So timing a well-crafted and compelling summation of your upcoming event (or anniversary, etc. ), and using the proper lead time for contacting them is vital. But given the relentless time pressures in this industry, DO keep it on the lean side initially. In fact, a key strategy I employ is laying out the salient points and then asking permission to send additional information – especially re: a press kit. Contacting someone for the first time and inundating them with attachments is generally received very unfavorably by the media. When you do supply them with additional information, keep that on the lean side too as they simply don’t have time to wade through lengthy manifestos and mission statements, wordy bios, etc. Bullet points work well and keeping key information organized onto a single sheet of paper per component if possible is very well-received, e.g. a fact sheet, event flyer, roster of executives/staff, etc. Another helpful tool if an event/story is highly visual is to setup an online Press Room to organize and house various documents (.pdfs) as well as both high resolution and low resolution images and/or a collection of video clips with running times notated. 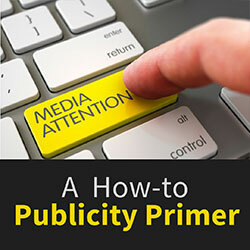 If you’re interested in having ongoing media coverage, the investment of time to setup this resource initially will serve your organization well over time as it telegraphs a welcome level of professionalism to the media. Be sure to label everything clearly and make the Press Room easily navigable. If event-oriented approaches don’t dovetail with the nature of your nonprofit or its current focus, stay sharp in turning around quick responses to news stories which relate specifically to your mission or goals. Once more, research is critical in terms of making contact with a journalist who covers that specific topic/beat or news director, etc. The media is continually needing to cite expert opinions – so be one for them. Again, keep your initial outreach lean in commenting on a developing news story is recommended; for example one that brings up a moral issue which relates to your work, proposed legislation, etc. Each individual pitch should always include your full contact information including all phone numbers, etc. Be prepared for the need to respond to follow-ups of theirs after-hours and DO reply quickly if this occurs. When an editor or producer wants more information, they’ll ask for it — and by pitching leanly you’re more apt to garner their attention, especially having not bogged them down by sending too much extraneous information on the front end. A significant game changer for any nonprofit is the acquisition of a celebrity endorser or participant – this was the tipping point for securing significant media coverage for the mega homebuilding event in Baja referenced earlier as nearly 20 Olympic athletes (the majority of whom were medalists) joined the build that weekend. The key in partnering with a celebrity is ensuring something about them resonates directly with your nonprofit’s work and/or the nature of the event itself ideally. For a nonprofit in Sonoma County who works with struggling families, I lined up the top-rated local radio personality to emcee the event along with the guest speaker who was a highly popular local Congresswoman, formerly a single mom on Welfare. “Celebrity” is anyone recognizable who will resonate with and help expand your story – both to your donors as well as the media, and keep in mind their sensibilities are likely shared, especially if you’re operating on the local community level. While these are just a few elementary but hopefully helpful tips vs. a comprehensive guide, an overarching principle to keep in mind is that “the media are people too.” So be friendly, warm, (although not chatty), professional, don’t bug them with too-frequent follow-ups, and for heaven’s sake, no whining (!) or acting entitled to coverage. Highlight instead why sharing your news will be of interest to their audience of readers, listeners, etc. vs. emphasizing what’s in it for you—alas, that’s simply not a selling point on their side of the equation. Be respectful which includes checking spellings and pronunciations, even gender, to ensure your greeting is accurate. Our names are ours alone and nothing gets an exchange off to a more awkward start than having to apologize for having made a blunder of theirs. For example, I have a nickname which is commonly a man’s name, Sam, but I’m female. So I’m not keen on calls that begin with someone asking for Mr. Jernigan. Similarly, the editor who oversaw a story on a client of mine in Elle Magazine was herself named Alex. And since S.A.M was an acronym born when I had a different last name, so I also don’t appreciate being addressed as Samantha. At this point in our culture, I do just use the informality of first names for media outreaches and this is pretty universally accepted, and I then respond with however they sign off in their email reply. The People editor who assigned a writer for our mega Memorial Day nonprofit event is named Elizabeth, but when she wrote back she signed off as Liz, so that’s also how I addressed her from then on, but let them greenlight their own nickname — we all remember the lil’ ditty about what happens when we assume. Lastly but definitely not leastly, regardless of whether you’re courting the notion of follow-up exposure with a given media after landing an interview booking/coverage by them, be gracious and DO send a handwritten thank you note in the mail to the producer/editor after the fact. You’ll not only brighten his or her day when it’s received (remember, they’re a fellow human! 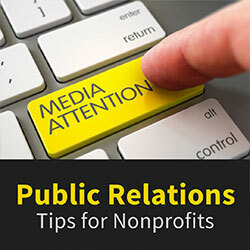 ), but you’ll have left a positive impression on behalf of your nonprofit. And, after all, that’s the whole point of pursuing publicity in the first place, right? It’s also fine to send them any newsy tidbit a month or two down the road – you never know, and cultivating a potentially ongoing relationship as an expert source of theirs is a possibility. Just don’t add them to your roster for donor appeals or regular ezine updates, etc. as the last thing a busy media pro needs is more clutter in their in-box. Cheers and g’luck…! Nonprofit PR: Where do I even start?